Itching to win some high-end PC hardware? Then HEXUS is the place to be! For our latest giveaway, we've teamed up with the good folk at Corsair to give you the opportunity to win one of two awesome upgrade bundles. For our grand prize we have an award-winning Hydro Series H100i Pro RGB liquid cooler, a gold-certified and fully modular RM750x power supply, and a trio of ML Pro RGB fans. 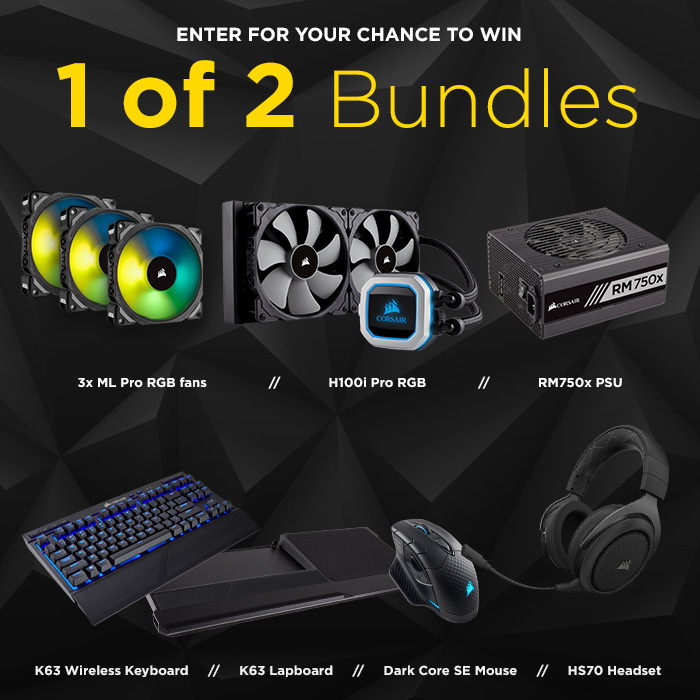 But we're not stopping there as one lucky runner-up will bag a peripheral bundle that includes a K63 Wireless mechanical keyboard, a K63 Lapboard, a Dark Core SE mouse, and a HS70 gaming headset! Two amazing bundles and we're giving them away for free! Want to be in with a chance of winning? Simply answer the following question to enter our prize draw, and don't forget, you can also claim a second entry via Facebook. Thank you for taking part and good luck! The competition winner will be picked at random from all eligible entries that arrive by 22:00 London time on the closing date, September 7, 2018. The winners will be notified via email by September 14, 2018. The winner must claim their prize within 7 days of the promoter sending notification. If the prize is unclaimed after this time, HEXUS reserves the right to offer the unclaimed prize to a substitute winner selected in accordance with these rules. First prize is a H100i Pro RGB CPU cooler, an RM750x power supply and three ML Pro RGB fans. Second prize is a K63 wireless keyboard, a K63 lapboard, a Dark Core SE mouse and a HS70 headset. EKWB Vector Radeon VII water block launched Deepcool shares info about its patented anti-leak technology QOTW: What wattage is your power supply? Elgato Thunderbolt 3 Pro Dock QOTW: How fast is the storage in your PC? Very nice. Many thanks to Hexus and Corsair.